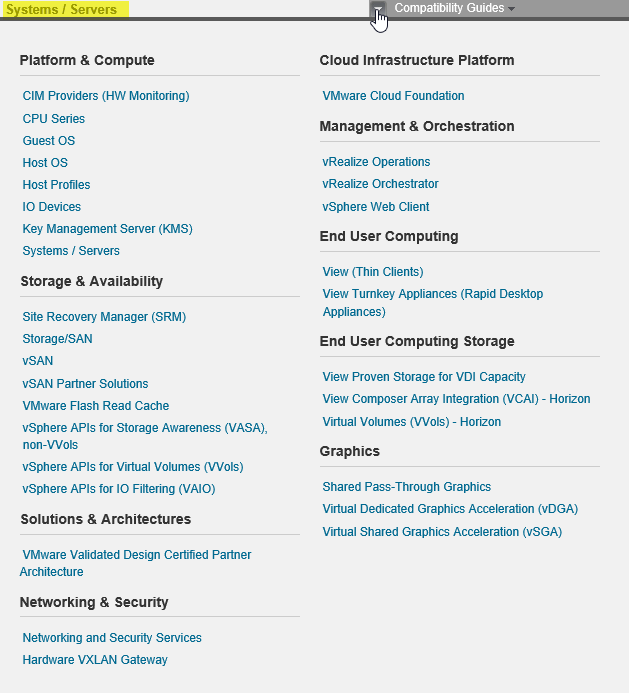 vSphere 6.5 has been generally available for several months now with the first release date being October 2016. Not everyone was excited to jump straight onto the vSphere 6.5 bandwagon though and for good reason. There were product interoperability issues at launch (I’m looking at you NSX), not to mention it is typically expected for companies to wait until the first major update package is released to make sure issues have been ironed out. However, a lot of the frustrations experienced by early adopters seem to have been resolved in minor patch updates to ESXi and to the vCenter server platform. vSphere 6.5 VCSA (vCenter Server Appliance) made a move to the VMware Photon OS which is a minimal Linux container host optimized for vSphere. What this meant for us, vSphere consumers, is that VMware appears to be more agile in delivering more frequent updates to the VCSA platform. At the time of writing, we are looking at the 6th minor release update of VCSA, 6.5.0e. That is about an updated release once a month. Now, the key to any successful project is the planning stage. The project needs to be well thought out and potential issues need to be identified before continuing to the implementation stage. Timescales for project implementation are also defined at this stage. For a vSphere upgrade project, take stock of everything in the environment that touches the existing vSphere infrastructure. At a high level, this will be things like ESXi hosts, storage arrays, network equipment as well as any software integrations such as Veeam Backup & Replication, monitoring software and other VMware products such as Horizon View, vRealize Operations, NSX, ETC. You can use tools such as RV Tools to capture some of this information. 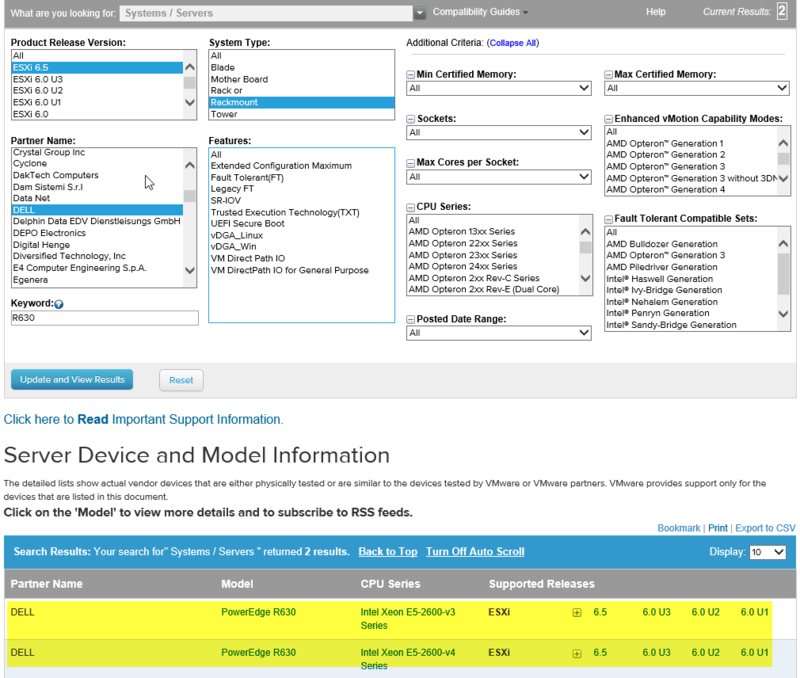 Host models and specifications can be gathered using this tool as well as current vCenter version. I will explain why this is important soon. Once the fact-finding exercise has been completed, categorize all the infrastructure items into Hardware, VMware software, Other Software. Take note of the Systems/Servers drop down list. This can be changed to other item types such as SAN/Storage. It is up to the vendors to validate their solutions and add them to the list. If you do not see a device on the list, reach out to the vendor and ask. 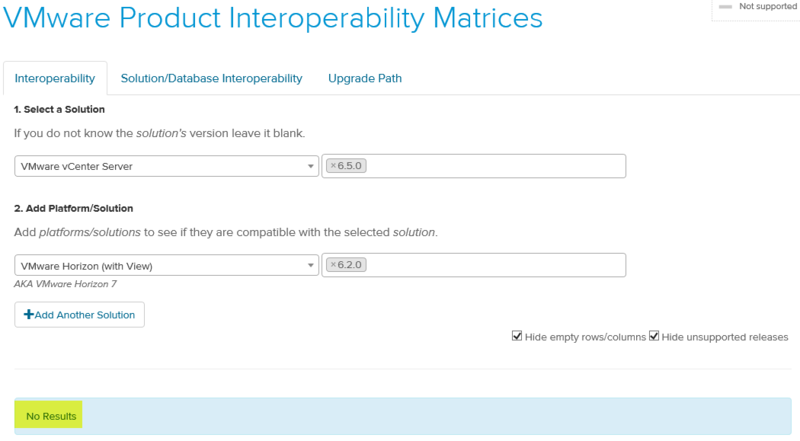 The VMware Product Interoperability Matrices are your friend here. Let’s run with an example of vCenter 6.5 and Horizon View 6.2. These two solutions are not compatible with each other as we can see from below. This leads us onto the supported upgrade path for VMware products: The VMware Update sequence for vSphere 6.5 . Using the example above, View Connection Servers need to be updated before vCenter server. Veeam Backup & Replication offered support for vSphere 6.5 in just three months after it was GA – in January 2017 – with the Veeam 9.5 Update 1 release. But in those three months, many people who jumped straight into vSphere 6.5 in 2016 quickly found themselves in a situation where they could not back up virtual machines with Veeam. This is another great example of why it is important to plan the upgrade process before moving onto the project implementation phase. Check with all software vendors that integrate into the vSphere environment that their product has been tested and is supported. Now you have all your ducks in a row as far as hardware and software compatibility is concerned, take a moment to check online for any other issues with the upgrade process. For example, at the time of writing, there is no direct upgrade path from vSphere 6.0 U3 to vSphere 6.5. Its things like this that can trip you up at the final hurdle. To summarize, research, research and research again to ensure that everything will work following an upgrade. It is better to eliminate an issue up front rather than it turning into a problem during an upgrade. Following these high-level steps should guarantee a successful upgrade project. New Technology Solutions Specialist for virtualization specialist SITS Group in the North East of England. 11 years’ experience in the IT industry with a focus on virtualization technologies for the last 8 years. Blog at www.snurf.co.uk.